Hi peeps, happy Memorial Day weekend and welcome to my stop on Operation Write Home blog hop. This is my first time joining the hop and so glad that I get to take part of honoring all men and women in our troops! If you come here from Melissa's blog you're on the right track. 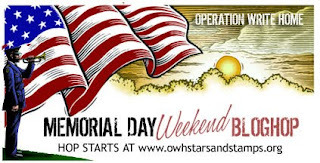 :) To start from the very beginning of the hop please go to OWH Stars and Stripes. To all the member of the troops, I want to thank you all for all your sacrifice and for your bravery. Because of what you do, we have the freedom that we're so often take for granted. From the bottom of my heart thank you for everything. The second card is simple card. I love simple card. This one again using the "Tweet Retreat" from Kathy Martin's collection. That's all the cards that I have for today. 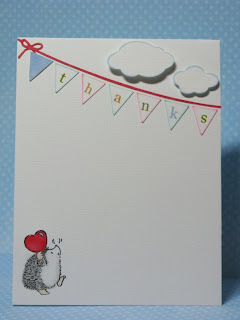 I am finally stop shaking from my shock of yesterday's announcement from Paper Crafts here. Pretty much spent the whole day being nauseous, because I was so excited, yet very nervous, too. So, besides blog hopping, I am planning on working on some cards this weekend. Keeping my finger cross! OK, your next hop is to Dawn's blog! Update: I decided to do some giveaway, I have so many things to be thankful for lately and I would love to share my blessings. Below is what I am giving away. Just a mix match of stuff. To enter please leave comments and I'd love for you to become follower of my blogs. Following my blog is not mandatory though. I'd love for you to follow my blog if you feel my blog can inspire you. Thank you for stopping by here and have a great and safe Memorial Day weekend! Hugs, Vera. It's Friday!! Yay... can't wait for the long weekend. I LOVED long weekend. Hoping to get lots of things done on top of having movie day as well. I want to see Prince of Persia! The preview looks so cool. Hoping the movie will be as good as I am hoping. Today, I have new challenge for you. 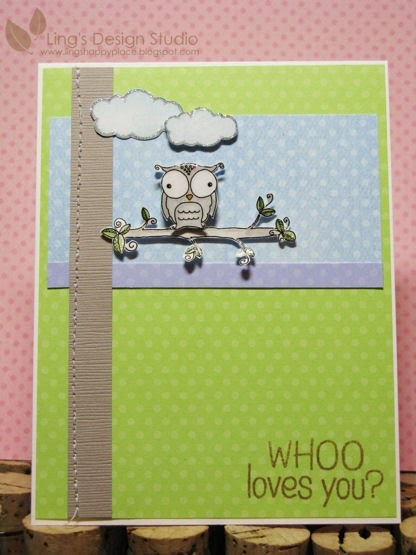 This time Mami Doodles is teaming up with Paper Play Week 21 Challenge, together we have this challenge "Up In The Air". For my card I used the owl from Mami Doodles' The Owl Family set. You'll get 2 images on this set. This is the card that I mentioned on my post yesterday. My very first card that have real stitching! Nice pat on the back for me. LOL. Wee Memories Challenge 7 - Sky's The Limit. So, you get anything plan this weekend? I have list going on. Hubby is working on renovating the master shower (I supervised, LOL), Operation Write Home blog hop, reading Fable Heaven last book, clean the house, clean my scrapbook room (hopeless...), finalizing our vacation reservation, and some more other stuff. Hope you all have a super duper great weekend and if you take a trip, be safe! Happy Memorial day weekend. Hugs, Vera. Hi peeps. This is my second post for the day. 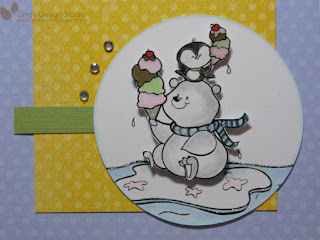 If you come to my blog looking for the Digi Doodle Shop blog hop, please scroll down. I was so excited yesterday. I finally managed to do actual stitching on my card. Granted, it's not the straightest stitch, but for my first time I think it looks pretty darn good. And... no poking my finger either. That needle make me nervous, LOL. The whole time I did the stitching, I didn't dare to blink at all. Afraid the line would be totally messed up or my finger get sewn. And when I was done, I was squealing with delight that my husband was asking what was that? LOL. I was so proud of myself as trust me, as I am sooo not a sewing person. I loved the result of sewing as I do love pretty dress and all, but not good at sewing. Growing up, I want to be a fashion designer, but bailed out when my mom said to be a good fashion designer I need to know how to sew. So, without further do, below is my card with my stitch (actually this is the 2nd card I stitched, the 1st one will be shown tomorrow for Mami Doodle's post). 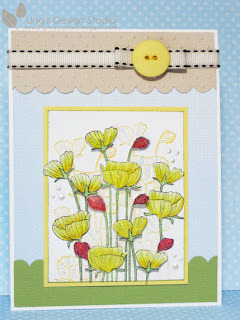 For this card I used Card Patterns sketch 65. The cute lovely "Tweet Retreat" image is from Kathy Martin's Digital Doodle (available at Two Peas In A Bucket). I fell in love with it the moment I saw it at Kathy's blog. Kathy's not only talented, but she's also super sweet. She always take the time to leave some thoughtful comments and I appreciated her for that. Hi all. 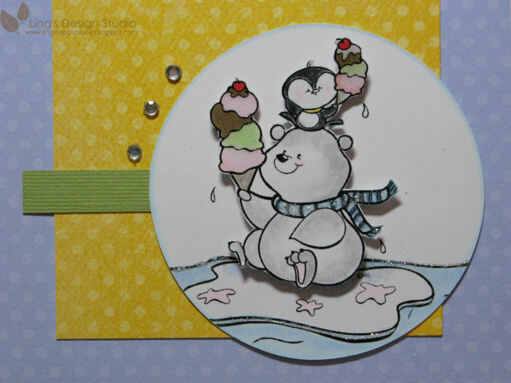 Welcome to the 1st Digi Doodle Shop's Best Blog Hop! 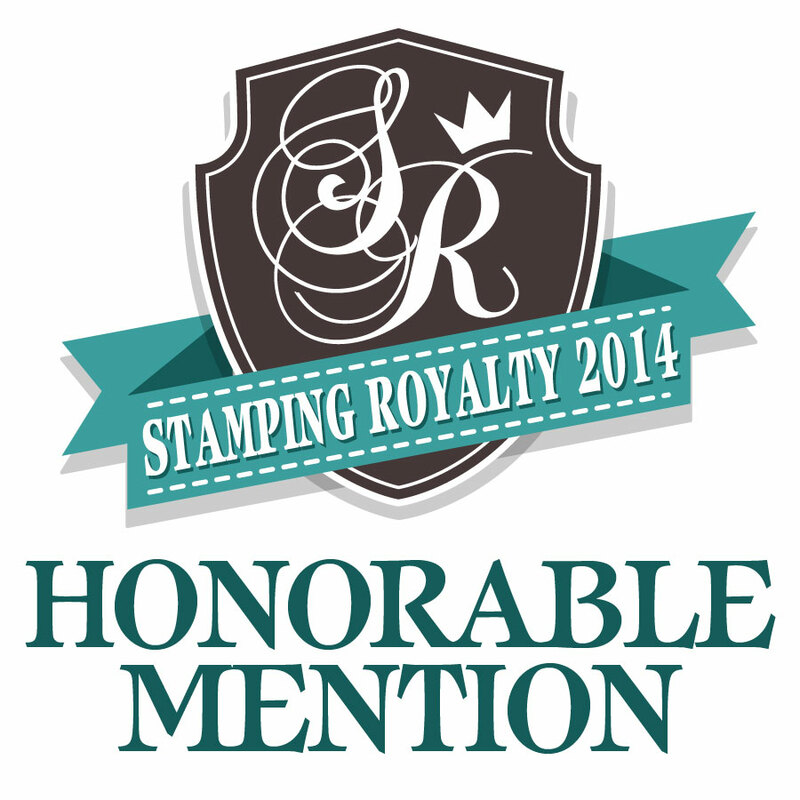 We are celebrating our two month anniversary as a store and 250 stamps for you to choose from. 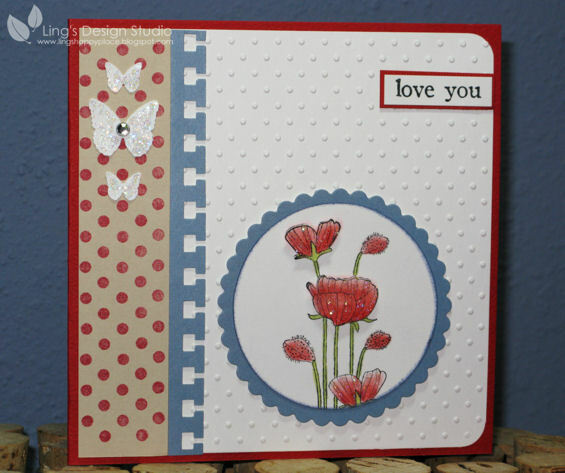 Judy and her lovely mom Joy have been working so hard to give you a variety of wondrous stamps and we decided to celebrate with our first blog hop! If you came to my blog for your usual visit, I want to thank you for your visit, but if you are here to hop it is best to start at the Digi Doodle Shop that way you will not miss a thing. Now if you came here from Harriet's blog you are in the right place. 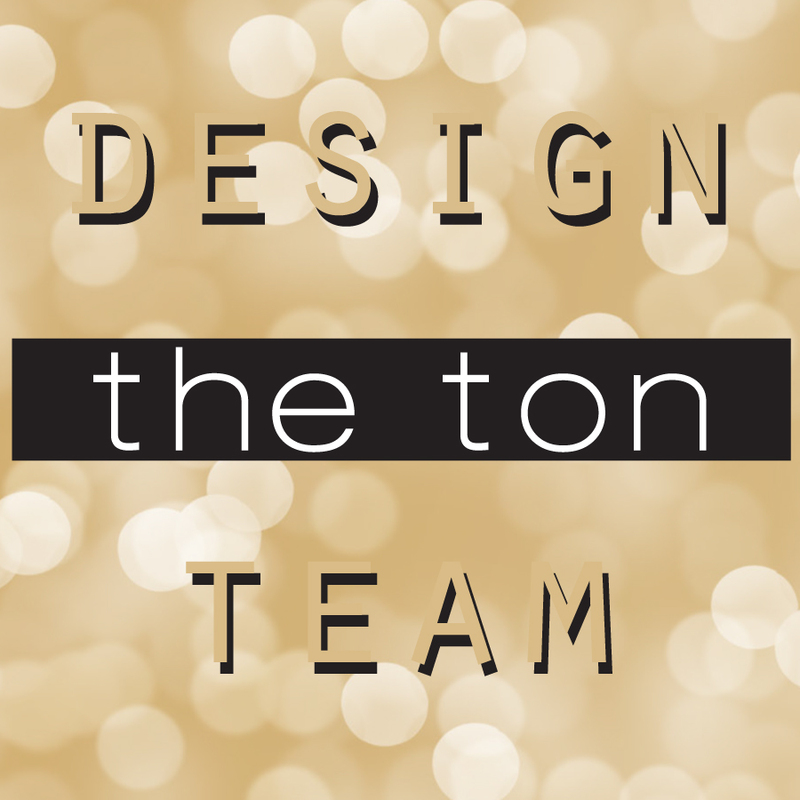 Please be certain to get to all of our talented Design Teams blogs and leave a comment. You will find inspiration on every blog. 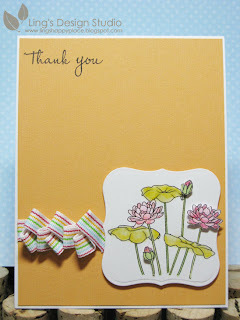 For my card, I used the Lotus Blossom using FTL91 sketch from Clean and Simple Stamping. I just love how the flower looks. I printed the image twice (flip one). One as the main image and the other one for layers. Some detail cutting involves, but I think the end result is worth it. LOL. What do you think? This week at The Digi Doodle Shop's Best Challenge we are having an “ANYTHING GOES” challenge! The winner will get a $10.00 gift certificate to the shop and with 250 stamps to choose from, I am sure you will have no problem finding wonderful images you like. The first, second and third place winners will also get badges to proudly display on their blog and will be entered into a drawing for a Guest DT spot with our great DT just like Sarah and Doreen! Also, three (3) stamps will be given away from three (3) mystery DT blogs. For further information see the original blog hop post. Now onto JoAnn to see what she has in store for you. I am certain it will be awesome!!! 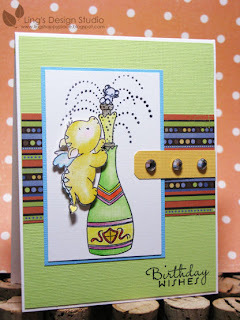 Don't forget to pop on over to the challenge blog at the end of our hop and enter your ANYTHING GOES card!!! Looking forward to your creations! Hugs, Vera. Wow... this week been so awesome. 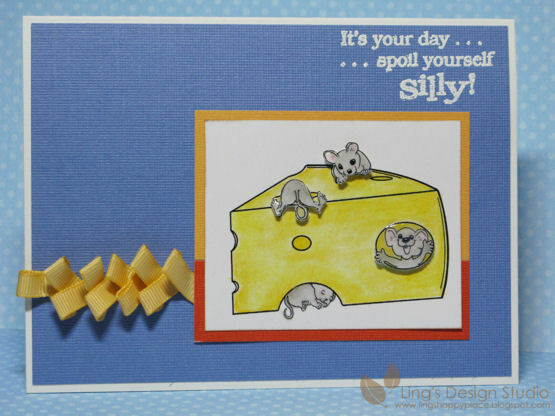 Monday, on top of winning the Paper Crafts giveaway (thanks Harriet for letting me know), I found out that my card here won the 2 Cute Rubber Stamp challenge. I think I was squealing when I called my husband to let him know. He was laughing, saying that I sound like my 12 year old niece when I am excited. LOL. Can't help it. 2 winnings in 1 day. Of course, I was jumping up and down. Wonder if my luck would work with the lottery ticket, too? Can you imagine how many stamps I can buy?? LOL. Isn't that image adorable? 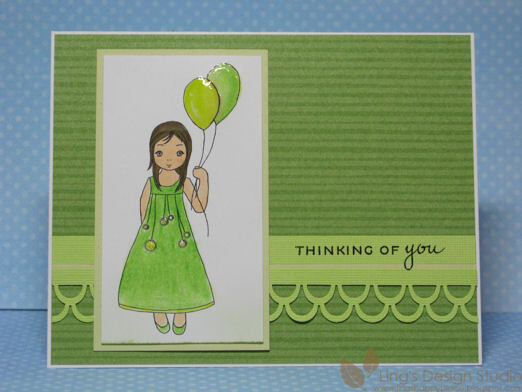 For this card I used the sketch from Whimsy Haven challenge, which I sadly missed the dateline. Sometime I just forgot date. But, I love the sketch, so I used it anyway. Below is the close-up pic. 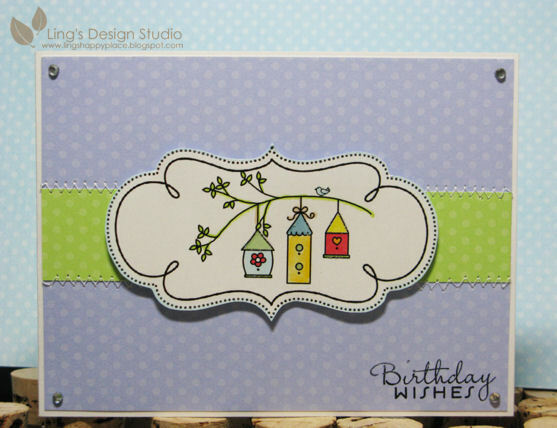 Entering this card for Crafty Creations Challenge 69 and Little Red Wagon # 30 as well.This stamp is just so darn cute, it makes me giddy. Yes, I am like a little kid when it comes to cute stuff. LOL. Today is my little brother, Jerry, who I call Boy or Boim, birthday. He's a year younger than me and actually taller than me, but still I refer to him as my li'l bro! :) He was actually in Boston (all the way from Indonesia) for photo shoot for Allure magazine for 3 days and have to spend his birthday up in the air as he's on his way back to Jakarta already. I am sorry that I can't see him. So close, yet so far away. He's my talented photographer, graphic designer brother. My partner in crime back when we were kids. The one who believe I am creative enough that I should pursue a degree in design. The one person I can laugh with without saying a word. We can look at each other and just start laughing. I love him to pieces and so very proud of all of his achievement. He took pics of everything. But, I especially love his underwater pictures that he collected through his various diving expedition. You can check them out here. I think y ou all will agree that they are AMAZING. So, Boy, happy birthday, I love you, and may your life continue to be blessed in every single way. Big hugs to you. Hope to see you soon. Miss all my family like crazy. Hmm.. get teary eye just thinking of you all. Hugs, Ling. Hi all. Time for May PTI blog hop. The theme for this month is to use felt on our project. I never really use felt in my card before, so this is kind of fun to try something new. And I found this sparkly felt. LOL, I just can't get away from sparkle and glitters. Yep, all of them are simple and clean design. Hope you like it. And to all the PTI blog hoppers, I just want to say thank you for all the amazing inspirations. 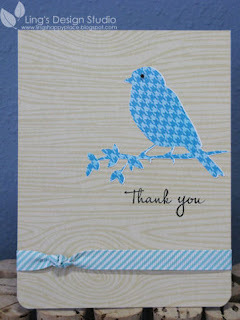 Each time we do blog hop, I get so many ideas and inspirations and your lovely comments truly made my day. Hugs, Vera. Happy Monday y'all! Try to say it with Texan's drawl. :) How you like my title? 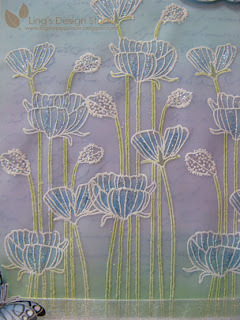 That's because today I have layouts & card to share with you & I rediscover my sewing machine. First, I am so happy today. 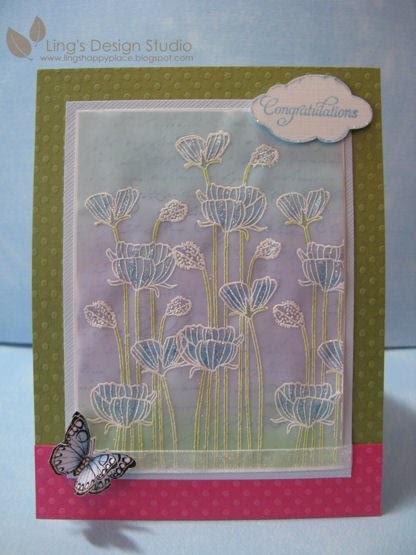 Just found out that I won the Paper Crafts Card Creations 8 giveaway. Yay... I love good idea book. All I can say is that I am so, so grateful for all my winnings and I appreciate all of them so very much. 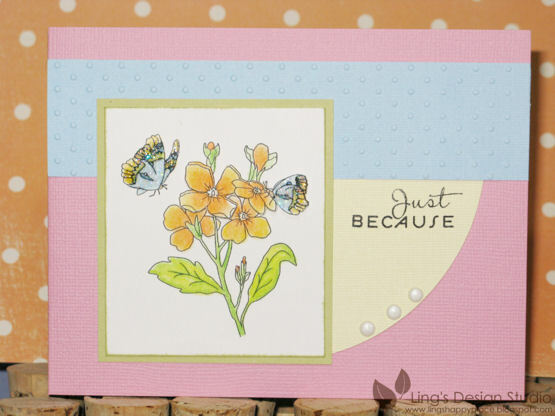 On Saturday, I received the Lily Bee collection from Jennifer McGuire giveaway. LOVED it!! The papers are so pretty. And I am proud to say that I accomplished almost 3 pages this weekend. Well, I completed 3 layouts, but for one I still haven't done the journaling. I am working on it. Here's the finished pages. 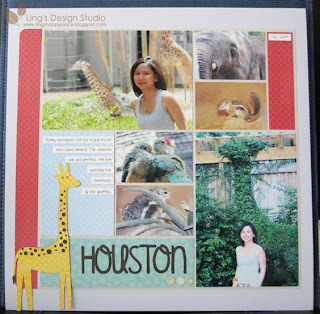 It's a two-spread layout for our trip to the Houston's Zoo. Here's the second page. I love scrapbooking collage style, cause I can fit lots of pictures! Definitely influenced by Laura Vegas a lot. Loved, loved her pages. See the elephant border? I made that using Silhouette print & cut feature. 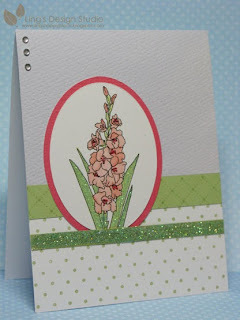 And, if you stop by my blog to look at card, I have one for you, too. Now, for this card, I am super proud by the fact that I recycled. See the awesome wood background? It's the backing from the Lily Bee sticker package. I was about to throw it away, then I stare at it and something click. Duh... it's nice looking, why don't I just use it? It's perfect for this Silhouette bird (used the Silhouette print & cut). I thought this turned out really great. It's simple, but eye catching, no?? What you think? I am entering this card for Paper Crafting Gallery Idol. My first time trying. Cross my fingers. To see all the cards that I sent for gallery Idol, click here. Oh, this weekend I also firgured out how to make my sewing machine works. LOL, yes I do own a sewing machine, bought it about 7 years ago, made 1 quilt with a friend assistance, that's it. I haven't use it since, don't even know how to do the bobbin. I literally have to pull out and read the user guide just to figure out how to thread the needle. It works, now I only have to brave using it for card or layout. I think my dad (who I like to think is watching me from up there) is probably clapping his hands when I did the first stitch. He always acted surprised when me or my mom even pick up a needle. LOL. Okay, that's a long post for today. By the way, this Thursday, Digi Doodle Shop's Best is doing a blog hop. Hope you can join us. Have a great week everyone. Hugs, Vera. Oh goodness, did you all watch Grey's last night? I thought they did such a good job. The whole 2 hours were so intense and yes some of the scene made me cry. I think the highlight was when the gun man pointed the gun to Yang while she was operating on Derek and how she refused to stop. And Meredith?? Her heartbreaking performance is so touching. For me, last night show ROCK, even though it made me cry a lot. :) Can you tell that I love Grey's??? And... 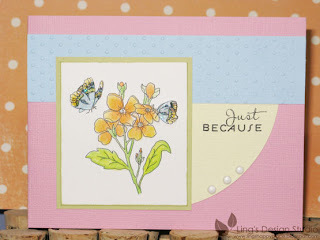 I have good news... Yay, I won the "Lily Bee" giveaway from Jennifer Mcguire! 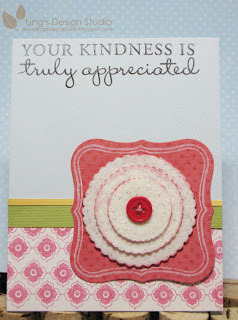 I am so , so grateful that in this past week I won 2 giveaways from my favorite scrapbookers. You can never have too many pretty papers! Since I am feeling so much gratefulness, I wanted to make a thank you card. Every now & then I just have that feeling like I have to make simple card. Sometime less is just more. This is what I came up with. For the banners, I used my Silhouette and use rub-ons for the "thanks". At first, I was gonna stop at that. Just simple banner. Then this little hedgehog was calling me, "Put me on, put me on." So, there he goes carrying my heartfelt thanks. Another thing I am excited about is I finally figured out how to make my Sihouette "print & cut" feature works. All I can say is awesome!! There's so much possibilities. I am hoping to get a layout done this weekend using my Silhoutte and will share it here (hmm... yeah, I am trying to put pressure to myself to get it done). Well peeps, happy Friday and may your weekend be a great one filled with all the things that make you happy! Hugs, Vera. Hello there! Seems like this month just flying by. Well, today Digi Doodle Shop's Best (DDSB) has new challenge for you all. And it's fun!! This week it's all about glitters and bling. I think I used glitters on most of my cards. Heh... how could you not love glitters? It make things sparkly and all pretty. 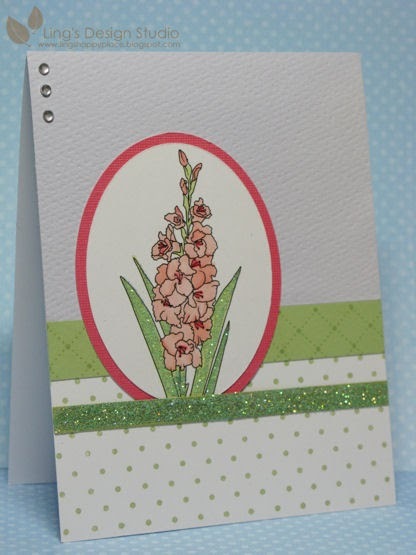 For my card I used this lovely gladiolus flower stamp. After I am done coloring them, I covered the leaves with clear glue and covered it with glitters. I need to learn to take better pic, as in real life this card is sparkling. I did the same to the bottom borders. Just covered the whole strip with glitters. 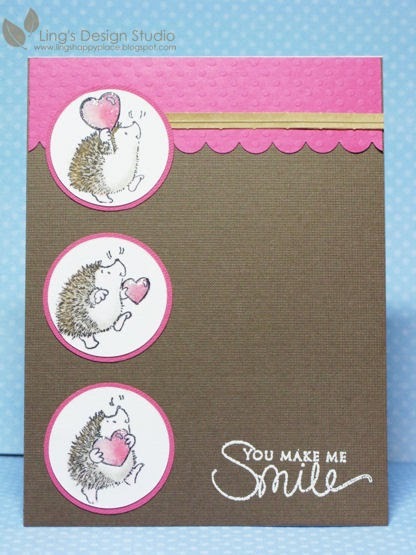 Come on, get your stickles and glitters out, and join us for this fun challenge. You can go to DDSB blog for all the challenge detail. Hope to see your sparkly creations! Ooh, quick comment for fellow Grey's Anatomy fans, did you see the preview for this season finale? Bullet involved. Wonder who's going down?? At 7pm tonight you can find me glued to the TV watching Flash Forward & Grey's. :) Hugs, Vera. Any of you fans of the Fable Heaven series? I love them. The series is about 2 kids that found out that their grandparents are the gurdians of mythical & magical creatures. Since I was a kid, I always love Greek mythology, fantasy books, and never quite outgrow it either. Well, to this day, I am a kid at heart. :) For me books like Harry Potter, Percy Jackson, etc., are easy reading and entertaining. And I love that they have good moral lessons in it, too. 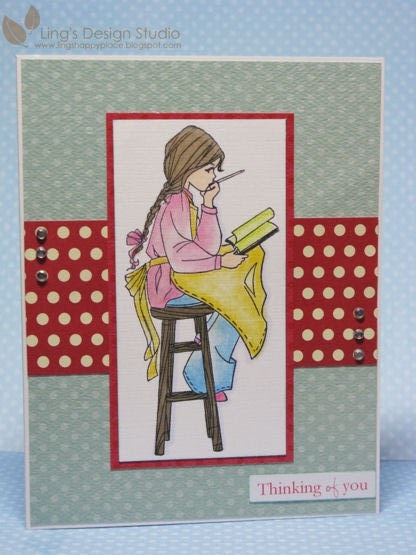 I am planning to get the latest book in the series by this weekend, so we'll see if I get to make any cards, then. Reading is my other joy. Once I start reading a good book, everything else is forgotten. 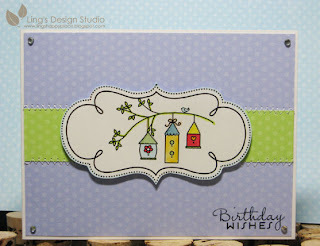 So, before I get to that point, I want to play with this Willow stamp from Whiff of Joy. The stamp designed by Elisabeth Bell and I have to say her image is simply beautiful. I saw some really cute ones online and they're definitely go on my wish list. Here's the card that I made, using TPE67 sketch. I think this is my first time entering their challenge. Can't remember, LOL, there's too many fun challenges out there. That's it for today's post. Hope you day is beautiful. Hugs, Vera. Yay... yesterday, I received the stamp from Whiff of Joy from my Paper Play challenge win. Thank you Whiff of Joy and thank you Paper Play. :) That's my first stamp from them and it's so pretty. I haven't play with it, yet, hopefully tonight. I've been browsing their store and so many beautiful stamps. Every time I think I have good enough stamp collection, I always find something else that I feel I have to have. Sigh... so many stamps, so little time and $$.., LOL. I mean, my goodness there's tons of goodness out there. How can we keep up? I also got this super duper cute hamster stamp from 2 Cute Rubber Stamp and as soon as I saw it, I know I have to play with it. This is so my style of stamp. I love it. 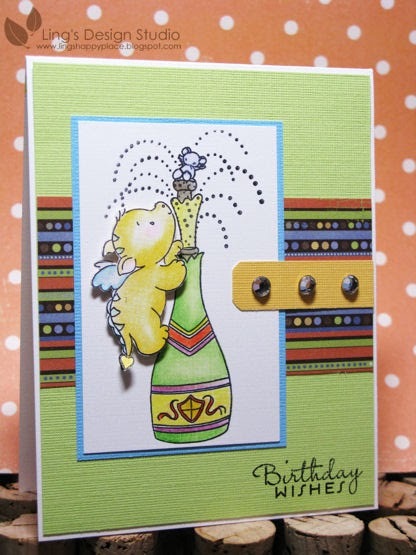 I made this card for their challenge using the Caardvark's May sketch. The patterned paper is from Bo Bunny Dots collection. Just look at that face, how cute is that? I really enjoyed coloring this image, cause it's way too cute and made me smile. 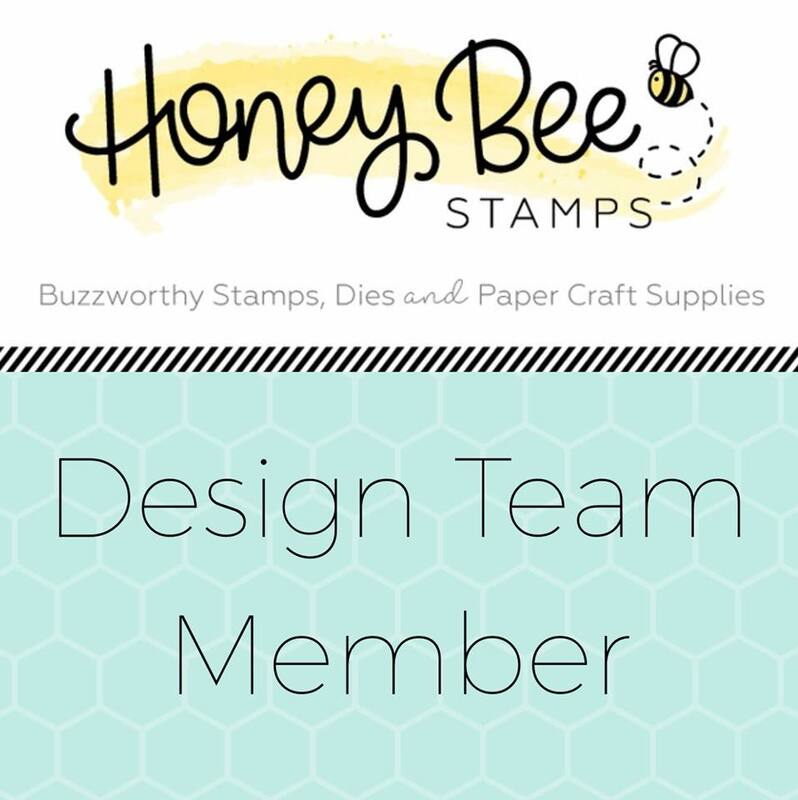 Do you have any favorite stamp company? Who do you usually buy from? Come on, let's enabling each other. 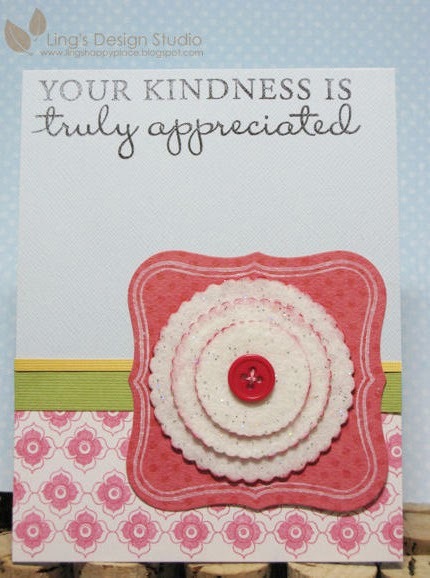 :) Thank you all for stopping by and I hope this card made you smile. Hugs, Vera. Happy Monday, everyone! 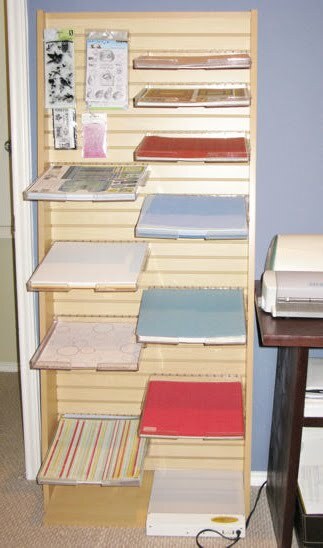 Let me talk about this baby card first, before I talk about my paper rack. :) I made this for my boss who just had their baby girl this past Thursday. I used Nelli Snellen stamp. Isn't this stamp cute? For this card I used the sketch from Sweet Sunday Sketch challenge 69 and I am also entering this for Sentimental Sunday challenge #3. I layered the baby cow twice with pop-dots and cover the moon with glossy accents. In person, the moon looks glistening and I added glitters to all the stars to make them sparkle. Back to the rack, they actually used this rack in the store to hang all their rub-ons.I almost get the one that strictly for paper, but ended up choosing this one as I can hang my papers and my clear stamps here. Since I am planning to hang some stamps on it, I only bought 10 of the plastic trays. Not sure if this is the final arrangement. And, also what I realized, I thought I was pretty good at not collecting too much paper, boy was I wrong. This is only maybe 1/4 or 1/5 of my total paper stash. I only put the ones that I think I reach most often on the rack. The rest still on my old paper organizer lined up on my Ikea shelves. After all the cleaning, I really wants to do more scrapbook. I have to use up my papers. Some of them are old, but luckily, I always buy papers that reflect my clean and simple taste, like KI Memories, SEI, Chatterbox, so 4 years later, I still love the paper and still want to use it. I love papers, gazing at pretty paterns, colors, makes me happy. Also, real quick, I want to mention that Digi Doodle Shop is sponsoring Daisy Doodles Creative Challenge. Please check it out and join if you can. You all have a great week! Hugs, Vera. Today my brother, Jeff and my SIL, Gina is celebrating their 15th anniversary (and yes, after 15 years they're still lovey dovey). They were highshcool sweetheart, dated for 7 years before they get married. I was in 7th grade then when they started dating, and I was immediately taken by Gina. She's the sweetest and she gave me a cute teddy bear for my birthday then when she just started dating Jeff. LOL, I have soft spot for soft and cuddly stuff animals. And for teenager to have her older brother's girlfriend paying attention to her, who doesn't like that? :) She definitely knows her way in handling me and my younger brother, Jerry. I alo made this card for CK Club card challenge, which is to use "trash" stuff. So that kraft color border, is garbage tie. 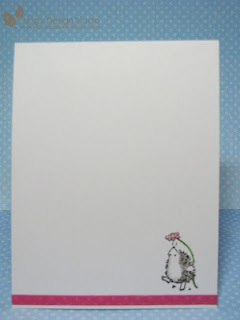 :) Below is picture of the inside of the card. I kind of like doing the whole inside out thing. It makes the card more polished and complete. I hope I can continue doing more card this way. I wish have enough time in the day where I can just create. LOL, I think we all wish for this??? This morning I'm off to check out my LSS. They're closing this Sunday after 10 years in the business and have huge sale going on. I love the sales, but feel sad to see them close. Another mom & pop store closing down. I already went there last night & bought one of their paper rack already, just need to pick it up and then get my paper all organized. I will take pic of it later, once everything all neat. Today, I'll be stocking up on papers and refills. Yikes, so much shopping. :) Hope you all have great weekend. Hugs, Vera. Oh my goodness, my Friday morning start wonderfully with an email from the super talented Laura Vegas. She said to check her blog as I might see something that I like. I checked the email to see if she cc anybody else, and thought, hmm this just for me. 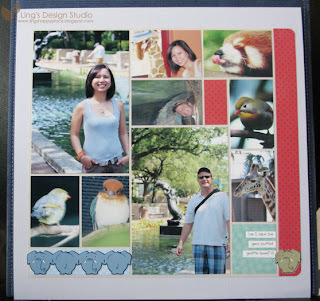 And I recently entered her giveaway for CK Fast & Fresh Scrapbook. Crossing my finger, I checked her blog and yay!! !, I won! :) Sooo happy. And yes, I am such a dork, I asked her if she could sign it before she mail it out. LOL. What can I say, the dork side of me won. :) I am a huge fan of her. Her style is clean and fun. Thank you, Laura! I am the type of person that doesn't take things for granted. I am grateful to say that I've been really blessed. I won little things here and there. They're little but they're stuff that I like, so I am happy. I won Scrapbooks, Etc. 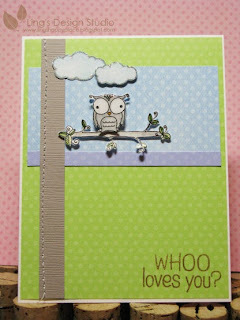 giveaway last year, this year Stampendous catalog giveaway, cute Willow stamp from Paper Play challenges, and now this. All I can say, my scrapbook & card making world bring me so much happiness. Now, let's move to card. Have you checked Elisa's Mami Doodle site lately? 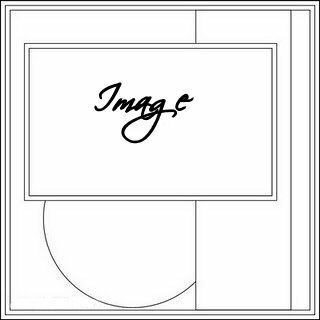 She just released a couple fabulous new digital stamp. If you're looking for the stamp, just scroll down her blog for the latest. We have new challenge for you this week. This time Mami Doodles challenge is monochromatic. This is what I created for the challenge. I used "Lucy with balloon" for the card. For €2.00 (about US $2.50) you get 2 images in this set. One is Lucy with plain dress and the other one has little decoration on her dress. I thought Lucy looks adorable. I colored her with Prismacolor pencils and added glossy accent on the balloons. I always love doing monochromatic challenge. What about you? I hope you can join us and play the challenge. To enter, you can use whatever stamps you want. That make it even easier, right? You have 2 weeks to enter the challenge, so that should give you plenty of time. Looking forward to your creation. Have a happy Friday, Vera. Hi there, today is time for Digi Doodle Shop's Best challenge 7. This week the challenge is easy and fun. All you need to do is create any project using ribbon. You can find all the detail on the challenge on DDSB challenge blog. The prize for this week is 3 stamps of your choice from *Wink*Wink Wink. 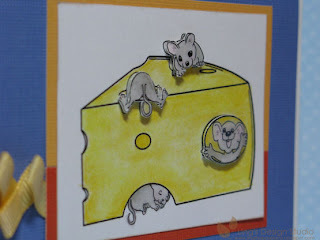 I love this cute mice image the moment I saw it. Somehow any cute mice image reminds me of my younger brother, Jerry. Maybe, because when we were growing up we were a fan of Tom & Jerry and just like Jerry the mouse, my younger brother is funny, a jokester, and always on the go. Made this card with him in mind, using sketch idea from CPS166. I am loving this ribbon folding technique at the moment. It's easy to make and I think it made a fun embellishments. Here's cose-up of the mice. I layered 3 of the mice. Did you see the one that sleeping inside? Isn't he just too cute?? I hope you'll come and join us on this challenge. Please take the time to check out the other DT blog as well (link on the left side bar). Have a great Thursday!! Then this morning, I found out that my silhouette birdie card was selected as one of the top 5 for CAS-tastic #2 challenge. Soooo excited! 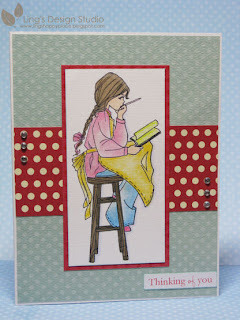 I love that card the moment I finished it and so happy to find out that others like it as well. 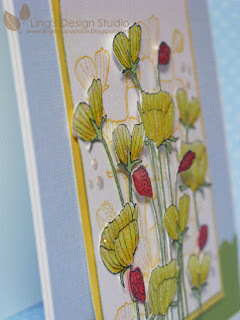 The above pic, shows the card open and below is the up-close of the flowers. I think the glitters works so well with the poppy flowers. What do you think? I love the close-up picture. It looks sooo dreamy. Hope you enjoy tonight's post and I'll be back tomorrow with Digi Doodle Shop's Best challenge! Have a great evening everyone. 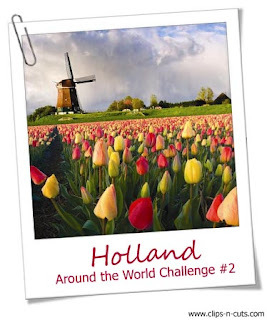 This time Vicky's Around The World challenge taking the inspiration from Holland. As soon as I saw it, I know I have to play. Holland is one of my favorite country and I had such a blast the two times I went there. My mom lived there for about 8 years with her adoptive family, and I love hearing her story about her life there. I always wanted to go there and when I did have the chance to visit, I fall in love with the place even more. The windmills, the flowers, simply lovely. So, here's my take on the challenge. I based the card using the Caardvark sketch. I thought their sketch this week is perfect to make the flowers stand out. 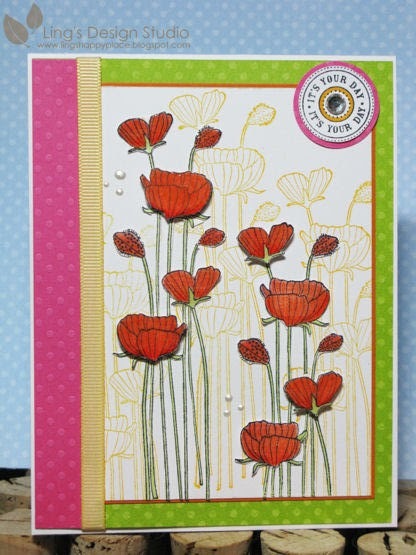 Basically, I want to capture the feeling of the tulip field, although since I don't have tulip stamp, I used Hero Arts Poppy stamp instead. There's a lot of cutting involved. Took me almost 2 hours to complete this card, because of the detailed cutting. 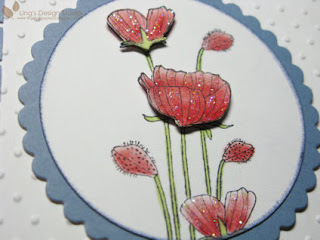 To create dimension, some of the flowers are popped with pop-dots and I added Stardust Stickles to make the flowers shine. I love the way this card turned out. 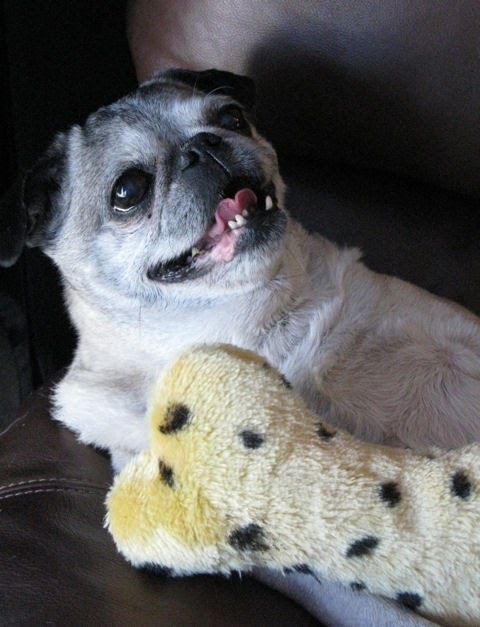 So cheerful and happy. For Vicky's Around The World Challenge, you can vote on the card that you like. I think you can vote starting Tuesday. Okie dokie, that's it for today's post. Hope your week have a great starts and let it be an awesome week! Hugs, Vera. If there's one person who I consider as my rock, that would be my mom. She's my constant supporter, who always encourage me, give me the nudge when I need it, and guide me when I am lost. My brothers and I really consider our mom as one of the smartest and wisest person we know. You can talk about anything with her. From politics to everyday silly stuff. She's sharp and very matter of fact. There's no going around her, she'll call you on it. And she's very rarely yell. Growing up, we know we're in big trouble when she's very calmly said she needs to talk to us. She knows she can get us in shape simply by talking. My cousins used to say that my mom has fire in her eyes. And yes, all the kids behave very well near my mom. My aunts could yell or what to her kids and they might not care. But, if it's my mom, that's a different story. She's the disciplinarian in the family, but she's also the sounding board for everybody. She's the peace keeper of the family and the glue that keep the family together. From her parents, to her siblings, to my cousins, everybody go to her when there's family issue. I wish my mom live closer to me instead of on the other side of the globe. I miss her all the time. I made this thank you card that reflect my feeling for my mom. I choose blue and green as the main color, cause blue reminds me of the ocean. It looks calms, refreshing, and underneath it fills with so much beauty and life. That's my mom. Always calm, and when you get to know her better she's so much fun, always up for anything fun, and has such a beautiful soul. And green, that's one of her favorite color. 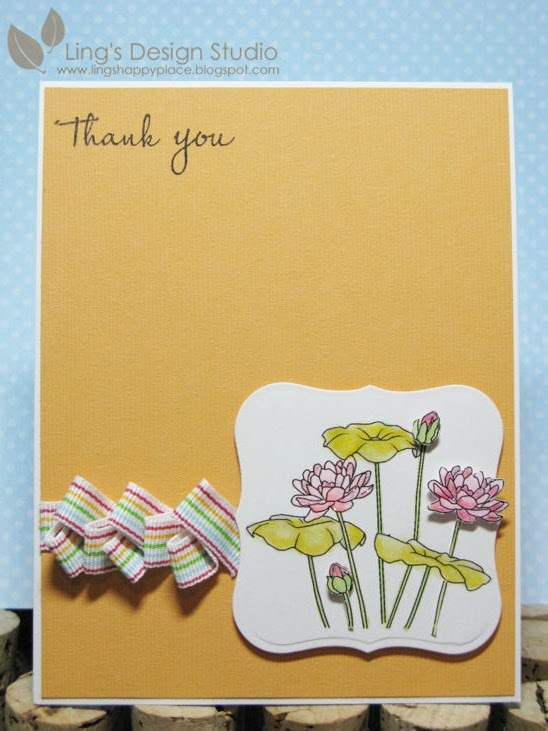 The sketch is from Mojo Monday 137 and I used Hero Arts Large Flower, Stampabilities Old Writing, and the greeting is from Papertrey Ink. This is my 2nd post for today. For Digi Doodle Shop's Best Challenge post please scroll down or click here. I have to post twice today. Too excited to wait another day. :) I am so happy that I finally figured out how to make my Quickutz Silhouette works with my new computer!! When I googled it before, someone said that Silhouette doesn't work with Windows 7. Then, Jackie one of my blog follower, emailed me and said hers work with Windows 7. Big hugs to you Jackie! If you didn't tell me, I wouldn't have known. And the customer service from Silhouette was superb. They emailed me back promptly each time I had questions. Finally, after 3 days of trying, my beautiful toy is working to my satisfaction. Happy tears. LOL. Can you see how excited I am? My second card is the result of my Silhouette. I loved, loved the fact that they are working together with American Craft. The bird is American Craft image. LOVED it! And since the moment I saw it, I know I want to make the bird at the main focus and I know I want to keep the card clean looking. I am really happy with the way the card turned out. Just the way I envisioned it. When I used my Silhouette, I tend to use white cardstock and then colored the image afterwards. Here, I colored it with Copic and Prismacolor markers. 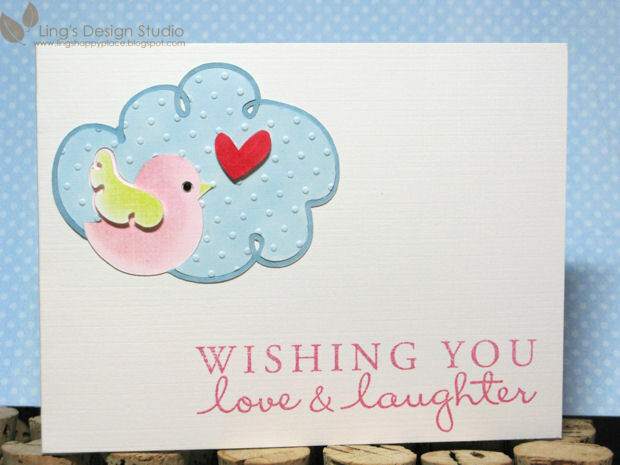 I embossed the inside of the cloud for texture and attached the wing and the heart with pop-dots. 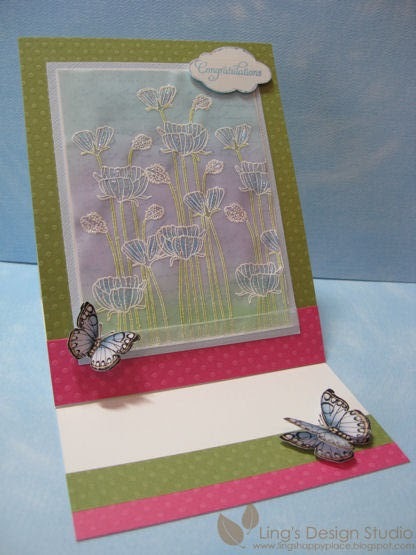 I am entering this card for CAS-tastic Wednesday challenge 2. One more thing, I just have to share about my talented MIL, Jane. I am so grateful that I am one of those lucky people that have a loving MIL. And, on top of that, she's very talented, too. She does pottery, jewelry, etc. This week, she spoiled me rotten. She dropped 12 sets of earrings for me. 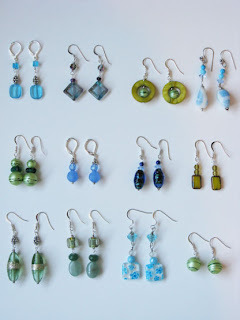 I just have to take pic of all the earrings. And she said she still has more. I was like, umm... you just gave me 12. I told her she should sell her stuff at Etsy. If you think she should, leave me some comments, so she'll believe me when I said people would buy her stuff. :) Thank you mom, for the awesome earrings! And here's my interpretation of the sketch (I did it horizontally instead of vertical). The picture didn't quite show it, but the flowers actually have a couple layers to it and both butterflies are covered with glitters. When I do butterfly, I always add a bit or sometimes a lotof sparkles. For all the detail of the challenge and the fun prizes please check the Digi Doodle Shop's Best Challenge blog. Remember, you don't have to use Digi Doodle Shop image to enter the challenge. But, if you do, your entry will count twice. Looking forward to seeing your creations!! Tuesday night at our house is "Lost" night. I am a big fan of the series and Tuesday night, come 8pm, we'll be ready in front of the TV. Is any of you a fan of Lost? Oh my goodness, as the story come to an end soon, it's getting so intriguing. And, sad on some part. I cried when Sun & Jin died. I know, I know it's only a show. But, I am one of those people that cry watching movie. Heck, I got teary eyes watching the animation UP! :) I sure hope this whole thing have happy ending. If you're Lost fan, please share your thought about this final season! Also, I want to remind everyone that there's still time to enter the Mami Doodles 2nd challenge. It's easy peasy, all you need to do is to make anything with a garden theme. And you can use whatever stamp you want. For challenge and prize detail juct click on the link. OK, that's all for today and tomorrow I'll be back with Digi Doodles card & challenge. Happy Cinco De Mayo to those who celebrate it! Hugs, Vera. About a month ago, I saw this cute, cute dragon on flickr and I fall in love with it immediately. I contacted the card owner to find out where can I get that stamp. Low and behold, I have to get it all the way from Belgium. My 1st order ever fom Belgium. Yes, I wanted the stamps so badly and the owner of the store was so kind. She gave me the code for the free shipping special that they offerred at the time. And it arrived within a week. 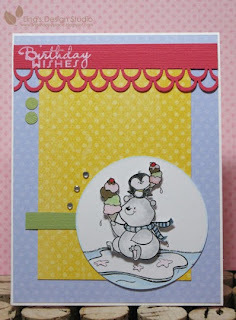 For this card I used CPS sketch # 165. I love this sketch and so happy I can finally use Smookie. I cannot believe that I had this stamp for a month before I actually use it. Considering I ordered it as soon as I found out where I can get it. I still have another one that still brand new in a package. Yep, I am dealing with health issue again. So, it's been a bit if a struggle to be creative when you're feeling dizzy or nauseous a lot of time. And no, I am not pregnant. Have many people asking me that. I wish that was why I am not feeling good lately, but unfortunately that's not the case. Still trying to figure out what's wrong. Meanwhile, I am just happy I can make good card again. I haven't been too happy with the cards I made lately. Maybe I am just too harsh on myself?? Well, I hope you like the card today. And, also I want to give a big thank you to Nancy for her lovely card that I received in the mail. You're the best Nancy!! This is what happen when I try to plan my weekend. Came home Friday after work and found my laptop has crashed. Tried to turn it on and nothing happen. Check and recheck, nada. Zip. Zero action. I was getting frustrated and panic a bit as all I can think of was I haven't back up any of the photos from 2009. Like any scrapbooker, it's all about the pictures! Hubby calmed me down and said first thing tomorrow morning we'll go to Best Buy. There goes my plan of scrapbooking. Saturday morning went to Best Buy and they said for the cost of repair, might as well get a new computer. I saw that cominf. And luckily, they said they can back up the data from the old computer and transfer it to the new one. I wasn't planning on spending for new computer, but can't imagine my life without computer either. LOL. So, there we were browsing around and debating what to get. To make long story short, we chose this beauty. It's not a laptop, and not quite a desktop either. It's HP Touchsmart. This is the whole computer. Isn't it a beauty?? At first, hubby thought I should get Mac, but I just couldn't justified spending on Mac. Then we saw this, played with it a bit and the rest is history. We had to come back to pick it up on Sunday as they have to get it all set up and transfer the old data to this one. I still have to play with it. My old laptop was 15" this one is 20", so definitely better for photo editing. And the touch screen, oh my... YUMMY! I could zoom in and out simply by moving my fingers. The only thing I am not too happy about was that my Silhouette wouldn't work with Windows 7. But, hubby said I can connect it to his laptop. So far, that's the only glitch I have. So, I didn't get to do any scrapbook whatsoever. Was quite disappointed with that, but maybe this week. Didn't get to make any card either. How about an old post then? 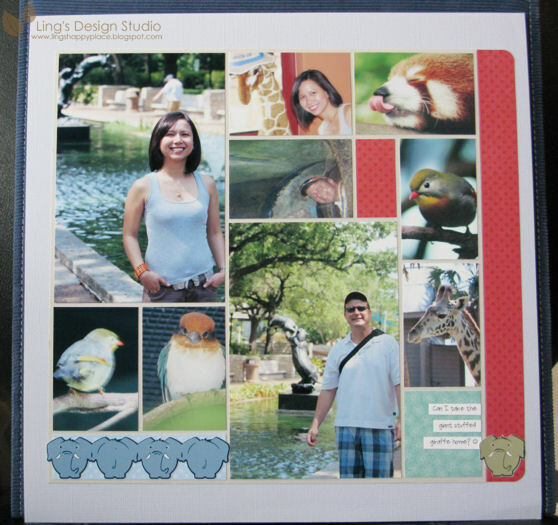 Here's a pic of a scrapbook layout that I completed last year. And, I have to share this pic of my pug, Ollie. She likes to pose and truly she's my baby. I have her since she was only 6 weeks old and she's been there for me through the up and down. She's my snuggler and my sunshine. OK peeps, enough rambling for today. Be back with a card tomorrow. Hugs, Vera.